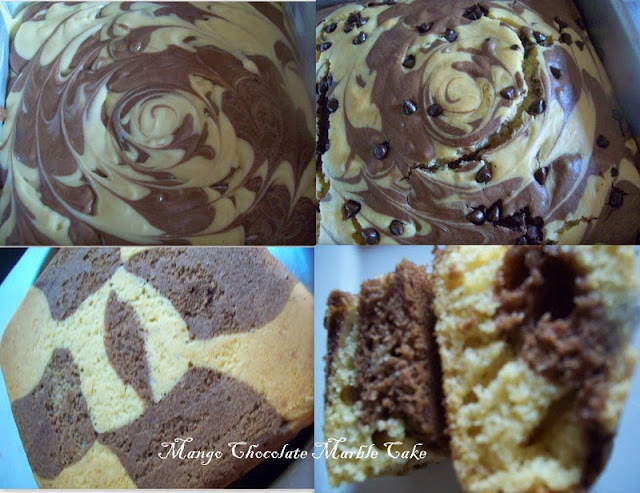 This Mango Chocolate Marble Cake is for the second Home Baker’s Challenge started by Priya Suresh and hosted by Sangee Vijay. 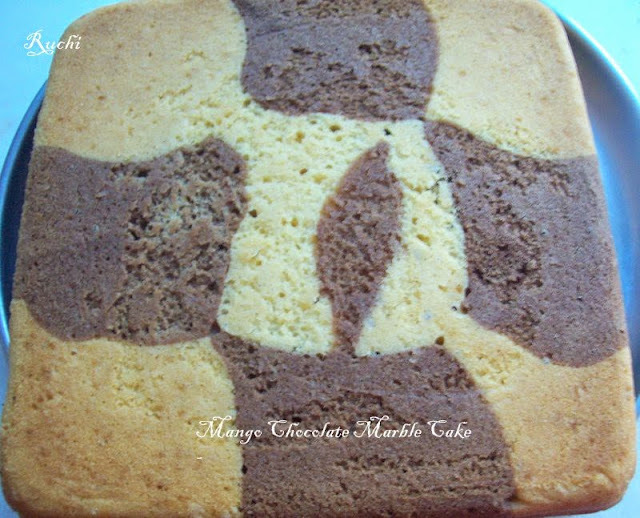 This month challenge was to bake mango and chocolate cake announced by. Sangee Vijay. Though she gave both egg and the eggless version, I chose to do the eggless and the butter less version which was simply superb and yummy. This cake is delicious, with a unique taste of Mango and chocolate together. In home everyone loved the marble effect on the cake. The whole cake disappeared within an hour. I am sure to bake it again soon. 1.Preheat the oven to 180 ˚C, grease the baking pan with non-stick spray or butter or use a parchment paper. 2.For mango puree, I cut one big mango pulsed the flesh part in the mixer. If you are using small mango use about 2 of them. 3.In a bowl sift together flour, baking soda, baking powder, then mix the salt in the flour well and keep it aside. 4.In a small bowl add cocoa powder and 2 tbsp of warm water and mix well. 5.In another big bowl mix oil and sugar together, then to this add vanilla extract, mango puree, milk, butter milk and mix well. 8.Now transfer half the mango batter to another bowl and add this cocoa paste and combine well. 9.Pour half of the prepared mango batter in the baking pan. To the remaining half add the cocoa powder and mix with a spatula/spoon. Pour the chocolate batter over the plain mango batter and with the help of a toothpick lightly swirl the batter around a few times. 10Bake the batter in the oven for 40 – 45 min or until done. Check by inserting a knife or toothpick which will come out clear. 11.Place it on a wire rack and allow it to cool for 10 minutes in the pan. 12.Now flip the cake on the wire rack and allow it to cool completely.then Slice it and serve.